Oh…what an easy theme we have for the SUO challenge this time…it’s your favorite new stamp set. This was another of my ‘must have’ stamp sets with my first order and then did I play with it???? NO!!!! So I really wanted to play with it, I REALLY needed a make and take for a group of wonderful ladies AND I needed to do my SUO challenge card so I put them all together and this is what I got…so quick and easy and a GREAT way to showcase this set! Mint Macaron – 3 3/4 x 5, run top 2/3 through the Elegant Dots Embossing folder. Watermelon Wonder Envelope dsp – 1/2 x 3 3/4, add to panel then add panel to card front using dimensionals. Whisper White – 3 x 4 and run though the Lots of Label framelit. Cut it down so it is 3 1/4′ long. Stamp stems in Mint Macaron, flowers in Watermelon Wonder and sentiment (Tin of Cards) in Memento Black. 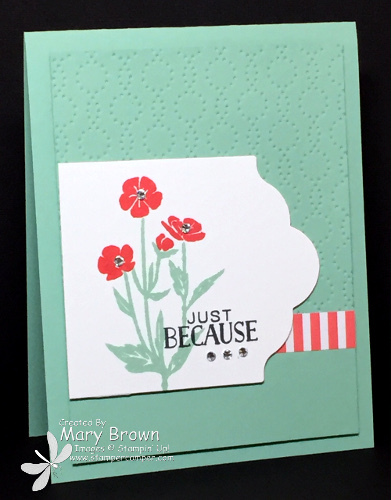 Add piece to card front using dimensionals. This entry was posted in Make and Take, SUO Challenge and tagged Tin of Cards, Wild About Flowers. Bookmark the permalink.